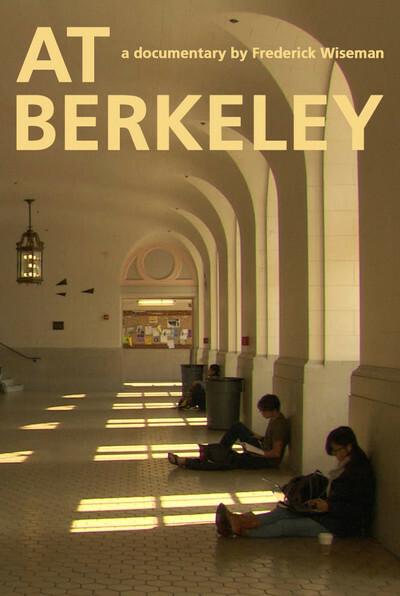 Frederick Wiseman's four-hour documentary "At Berkeley," about the University of California at Berkeley during the 2010 state budget crisis, makes me wish this site had a dual rating system: one for people who like a certain sort of film, another for people who find that same sort of film intolerable. In such a scenario, the rating at the top of this page would be aimed at the first group, and there'd be a zero star rating for the second group, which wouldn't willingly get within ten miles of a movie like this. Wiseman wouldn't lose a wink of sleep over that second group. He's been making documentaries like this one for 50 years: long films with no narration, no talking heads, no identifying titles or timestamps, indeed nothing to anchor you but the title and whatever the people onscreen are saying and doing. At the same time, though, Wiseman gives you a sense of what Berkeley looks and feels like: the gorgeous campus with its mix of old and new buildings, some elegant, others characterless, and the way light bathes them when the sun slips behind a cloud, and the way shadow-fingers caress the quad and glide across fountains and bike racks and ivy-covered walls. "High School," "Hospital," "Basic Training," "Welfare," "Canal Zone," "Belfast, Maine," "Domestic Violence," "Boxing Gym": each Wiseman documentary takes its title from a place. Some of his films have journalistic "hooks," or news pegs—for example, the second half of "At Berkeley" contains footage of students protesting the economic strangulation of a once-great public college, and administrators expressing sympathy while leaving maneuvering room for harsh measures—but they don't draw their impact from recent events alone. They capture specific qualities that were true at a certain time and likely always will be. He's America's finest living portrait artist of institutions and their mindsets: a great pure reporter. The issues surrounding Berkeley—the political and economic forces that caused fees to rise and staffers to get laid off, and that prompted students to worry about their futures and administrators to worry about the future of Berkeley itself—these are all included, often emphatically. A veteran of the "Free Speech" movement decries “an utter lack of recognition or comprehension” in today's students, which heralds their becoming "a cynical, passive and uninformed people.” An unidentified expert tells a TV news crew that public education is suffering because a handful of mostly Republican state legislators signed pledges never to raise taxes for any reason; this forced the state to balance the budget by cutting government staff and services. "Yachts, fourth homes, billionaires, we can’t raise taxes on them," he says. "But what we can do is fire janitors, gardeners, kindergarten teachers, preschool teachers, lecturers, and raise student fees." These scenes can feel like cheats—as if Wiseman is finding a not-so-sneaky way to do exposition without technically breaking his "no exposition" pledge. For the most part, though, "At Berkeley" makes it points with brief yet striking images. These seem metaphorically ripe, sometimes mysteriously so, but they don't flower in the mind until you think about several of them in succession, in context of the entire movie. A shot of a student tightrope walker recur in your mind when you hear administrators describe their professional balancing acts. Shots of construction workers and groundskeepers and men with leaf blowers seem purely atmospheric until dire economic details creep in, and you realize they're collateral damage in budget wars. A student museum guide's speech about the Tyrannosaurus Rex, shots of young taxidermists stripping a bird carcass, and close-ups of mounted fossils could be editorial comments on Berkeley's future—perhaps a prediction that robustly funded public universities will go extinct, and that the United States will follow them into history, as the inattentive miner follows his canary. Wiseman is also master of "Look ma, no self-awareness" documentaries that analyze themselves without seeming to. Sometimes he includes scenes that feel like meta-commentaries on the mindset one must adopt in order to appreciate a Wiseman film, but without seeming too clever or cute. In one such scene we see a student production of "Our Town" with a Stage Manager describing life in Grover's Corners: "At Berkeley" as drama, Wiseman as narrator. In another scene, a professor gives a physics lecture that doubles as instructions for watching a very long film. He tells his students that there is "nothing in the brain that perceives time," and that temporal units of measure are probably just mental elaborations on the pulses of brainwaves. When you perceive time, he says, you "are relating an event...like picking up a book, or taking a drink of water" to "the measurement of days, the sun going across the sky" or to "a water clock, the measurement of drips," or to the pulsing of Cesium atoms. What this relating does, the professor says, is "create time" in the imagination while "our brains and bodies register events." "At Berkeley" is an event worth creating the time to experience.